"A perfect spring, summer, or anytime salad. Loaded with protein and fiber, but so delicious you would never guess how healthy it is! If you are making the salad ahead of time, add the dressing just before serving to keep the asparagus an attractive bright green. Leftovers keep well for a couple of days." Pour water into a saucepan and bring to a boil; add quinoa and salt, stir, cover saucepan with a lid, and reduce heat to low. Simmer mixture until quinoa is tender, 10 to 15 minutes. Remove saucepan from heat, let quinoa rest for 5 minutes, and transfer quinoa to a bowl to cool. Bring a large pot of lightly salted water to a boil. Add asparagus and cook uncovered until tender but still crisp, 2 to 3 minutes; drain in a colander and immediately immerse asparagus in ice water for several minutes until cold to stop the cooking process. Drain. 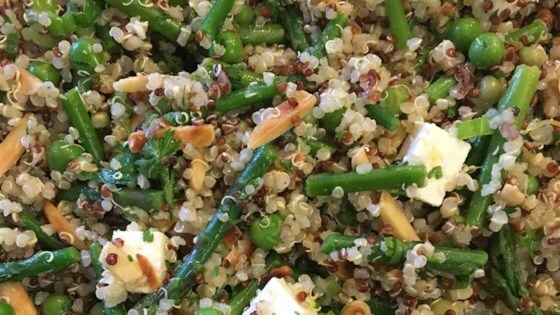 Stir asparagus, feta cheese, almonds, green onions, parsley, thyme, and lemon zest into quinoa. Whisk lemon juice, olive oil, honey, garlic, Dijon mustard, and black pepper together in a bowl until dressing is smooth. Pour dressing over quinoa mixture and stir gently to combine. Didn't like it much. The balance of flavors is way off for me. I was tempted to tweak this recipe, but so glad I didn't! Really nice balance of flavors; will make again and not change a thing! didn't change anything - GREAT recipe!!! Truthfully I have never cooked quinoa; but was looking for some healthy "different" dishes. Made it exactly as written, will sure do this again!! This is yummy. Seriously super yummy. Make it.